Aloha Salt Lake Tattoos offers Clean, Professional Tattoos by Friendly, Diverse Artists: Jon Poulson, Luke Jensen, and two other resident artists, along with numerous Guest Artists from across the country and around the globe. Using Modern, Sterile Methods - Completely Disposable single use equipment and only the Best tattoo Pigments available. Aloha Salt Lake Tattoos is a Salt Lake County Health Department Licensed and Certified tattoo shop. Conveniently located in the Central Salt Lake Valley on State St., just 1 block South of the Fashion Place Mall on the East side (towards the mountains) of State Street, next to Sam's Club and Get-Some Guns and Ammo on the in Riddle Plaza (Econo Laundry and Thai This Too) in the Southern tip of Murray, UT. Whether this is your first tattoo and you're just curious, or your a long time tattoo collector. 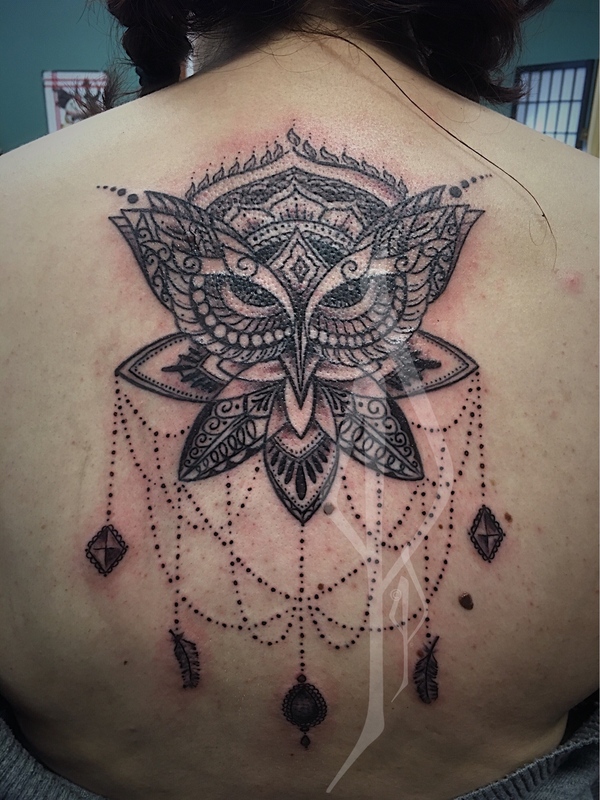 Whether you're looking to get your first large Tattoo Piece, begin a Tattoo Sleeve or Back Piece Tattoo, or just get a Small Simple Tattoo to test the waters of this ancient mysterious art form; Aloha Salt Lake Tattoos is here for you. We open early, and stay late 7 days a week for your convenience. We offer a relaxed, clean, professional environment with friendly and talented artists that can design your next tattoo to suit your needs and keep it within your budget. It's been missing from Salt Lake for too long... Aloha Salt Lake Tattoos, A professional tattoo shop that cares about you as well as your wants and needs in a tattoo. 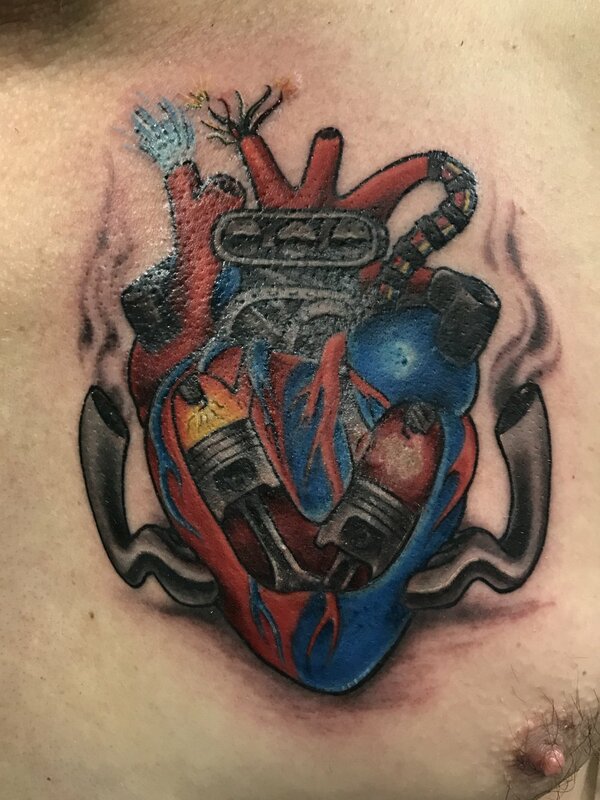 From new tattoos to cover-ups, from Cleaning up old work to Reworking existing tattoos, from covering scars and blemishes to covering your entire body, The Diverse experienced artists at Aloha Salt Lake Tattoos has your every tattoo need covered from head to toe. Below is a small sample of recent tattoo work done by the artists at Aloha Salt Lake Tattoos. For more information, more images, or to view individual tattoo artist portfolios, simply click on your tattoo artist of choice below. Or, if you prefer, come down to the shop and browse through our tattoo portfolios. You can even ask to see the most recent tattoo work that hasn't been uploaded yet. Schedule your Appointment Online! CLICK HERE. a classically trained professional artist that loves Tattooing; and it showes. Jon has made a career of art since 1992 Jon has earned a reputation as an award winning tattoo artist, consistently pleasing his clients and their referrals with the best possible tattoos while staying within each individual's budget over the past two decades. Finishing/Fixing tattoos that were started long ago. No tattoo is too small or too big; you name it, Jon has done it, or something similar to it. Jon is always excited to try something new to expand his artistic experiences. Jon is friendly and seriously despises that "holier-than-thou" and the "Better Than You or That Tattoo" attitude that is prolific at many shops in town. You won't find that attitude here; Jon is caring and compassionate with regards to each client's individual needs and expectations -- and it shows. 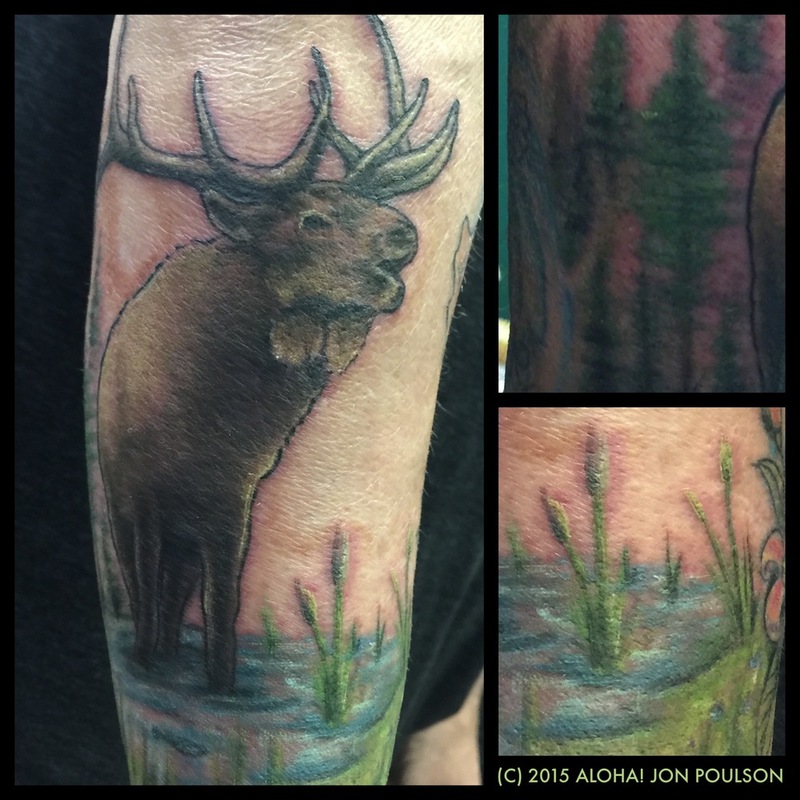 Jon is available most days, and would love to work with you on your next tattoo. Jon is generally the most in-demand artist at Aloha Salt Lake Tattoos. As long as there is an open spot in his schedule, he is available for your tattoo. CUSTOM LETTERING ARTIST WITH A DIVERSE STYLE TO SATISFY EVEN THE MOST DEMANDING TATTOO COLlECTOR. Luke has a wide variety of tattoo styles that he can cover. He can do things from black and grey realism to new school tattooing. He really enjoys tattooing custom free-hand lettering. This includes simple names to complex quotes covering large spaces on the skin. Many other styles to suit your needs. There is no doubt that this professional tattoo artist is quickly evolving into one of Utah's best Lettering artists. His detailed work draws people from all-over the Western States. Now that you have decided to get tattooed at Aloha Salt Lake tattoos, you may wonder what to do next, how to go about scheduling, what to schedule, etc... You can click here to help you decide what to do next or you can scroll down to get a bit more information. Keep in mind, you can always contact us to ask questions, etc... We are more than happy to help you in any way that we can. Click below to View our Schedules, and Book an Appointment that works best for you. It's online! It's easy, convenient, and FREE! Or, If you prefer you can Call (801) 609–8288 between 10a–8p daily, or submit your request below. All appointments do require a cash deposit, or a Credit/Debit card on file to hold the appointment Day and Time. When booking online, your card will not be charged unless you fail to show-up for the appointment without advance notice per our cancellation policy. Alternatively, you can come down to the shop and leave a cash deposit to book an appointment. Please note: while we do our best to accommodate your needs; without a deposit, or credit card on file, you do not actually have an appointment. When requesting an appointment, keep in mind that if modifications to artwork is involved, or if you require custom art, it will take additional time. The time you schedule is all the time that we have set aside for that tattoo appointment and we often have another appointment scheduled directly after yours. If you have questions, detailed modifications, or require custom artwork creation its best to schedule a consultation ahead of time. Custom drawings can take up to two weeks or more depending on our work-load, drawing schedule, and/or tattoo schedule. Good art takes time to prepare for; rushed artwork often leads to rushed results. This is going to be there forever and it's worth taking the proper time to prepare each and every piece of art thats getting tattooed. Be sure to fill out your Sign-In Sheet/Tattoo Waiver online prior to arriving at the shop, Available HERE. or at the link on the bottom of the page. It's easy on any device and it saves time when you arrive. Alternatively, the form will be provided at the time of your appointment while the artist is setting-up and preparing for your appointment. Proper state of federal (government) issued Photo ID is required each and every time you get tattooed in Utah. --Its the law, its easy to show, and we do insist. If you have questions about the forms of ID that are accepted, feel free to contact us prior to coming in. Click the button below to view upcoming schedules and easily select a date and time that fits your schedule. A consultation usually takes 5-20 min. In that time, We will sit down and answer your questions; discuss the specifics of your tattoo; review any images or designs that you like; determine specific placement and size; explain the tattoo process from start to finish; Answer your questions; then discuss your budget, pricing, and payment options. When you are ready to proceed, we will schedule a Drawing Review or Book a Tattoo Appointment; or in many cases Both. If you are new to tattoos; Not completely sure what you want; Have extensive design changes; or simply have questions, It's often best to schedule a Consultation before you book an appointment and then leave enough time to properly design your tattoo. Please don't just assume that you know how it all works because you watched a television program or know someone that got tattooed recently. So much has changed in the tattoo industry in the past 5-10 years, its better to ask than to just assume. A consultation ahead of time It will save us both lot of time and avoid confusion in the long-run. We're here to help you make the best possible decision, but we can't help you if you don't ask. If you prefer to speak to someone before scheduling anything, simply Call (801) 609–8288 during business hours of 10am–8pm. We are always willing to Answer Your Questions about Tattoos, Tattoo Design, and Process of it all; including artwork creation, sterilization, disposable supplies, healing, and more. Check out Jon's BLOG POSTS for answers to many common questions. Or, if you like, you can pick up the phone and give us a call, or send us an email or message, or you can simply stop by the shop during business hours. Either way, we'll generally have the answers to your questions. If you would rather just stop by to discuss your tattoo, or prefer not to be tied to a schedule and would like to simply walk-in to get your tattoo now. We will do our best to accommodate you as long as we are available but it is best to call us before dropping by. Click here to read about our pricing procedure, and how to go about getting pricing quote for your particular tattoo idea. Pricing is a question that's on everyone's minds. How much your tattoo will cost depends on a number of factors. You can click the link above to read about how we price tattoos, and why choosing a cheaper hourly rate or lower shop minimum isn't always a good idea. Choosing an efficient artist that can give you an amazing tattoo in less time is always the way to go. You will end up paying much less when choosing a better artist. Lower per hour rates often translate into a longer tattoo session. Choose the right artist, regardless of per-hour or minimum price. You'll end up getting far superior results in less time; saving yourself or your loved ones both money and time spent in pain in the long-run. The talented artists at Aloha Salt Lake Tattoos can draw and/or Design just about anything you want or that you can imagine. From completely custom freehanded designs to the simplest changes to an existing image you found; from a drawing that a friend or relative doodled years ago to a new complex creation never before imagined; from perfectly straight parallel lines and geometric patterns to loosely flowing flashes of color, and everything that you can imagine in between. However, the more visual information (images or drawings) that you can provide in the beginning, The closer we can get to the exact design you have imagined. We can even assist you in narrowing down your selections to help you choose the perfect tattoo based on your particular tastes. Please Note; A consultation is generally required to book most appointments over 2 hours and/or appointments that require extensive drawing/design or artwork changes. Getting the design completed is the most important phase of a tattoo, and usually takes the longest. Many drawings actually take 2-5x as long as the actual tattoo will take. Planning your tattoo results in the best tattoo possible. That being said, It is important that we have adequate time to design your particular tattoo. I Assure you, in the years to come you will not remember that it took a bit of extra time to perfect the tattoo design. You will however be reminded on a daily basis that a bit of extra time wasn't taken and you're stuck with a tattoo that's not perfect for the rest of your life and instead insisted that it be rushed to get it done then and there. While we often can often produce a quick mock-up of your design at no charge during certain consultations, A deposit is required to start ANY actual drawing or design. (The deposit usually ranges from $50-$250, depending on the physical size, the amount of drawing or design time required, and the length and date of the appointment.) Your deposit goes towards the final price of your tattoo as part of the artwork creation, and is not an additional fee. This deposit is however Non-Refundable. Tattoo drawings, sketches, drafts, or designs are generally non-colored line-work only renditions of the tattoo to be produced. Coloring and or shading the artwork is generally considered commissioned art, and at your artists discretion will incur a separate fee due to the time involved. In addition, it is impossible to mimic a tattoo digitally, or on paper. The results may be close, but skin is unique to each individual, and results will vary greatly. Tattoos involve trust, but we can only do as good as you allow us to know what you want. Communication on your part is key. We are trying to design something uniquely for you, and we only know as much as you tell us. Commissioned artwork on larger or multi-session tattoos do require a drawing appointment to complete. A drawing fee for commissioned work is based on the amount of time required to produce the art, and the type of art being commissioned. Generally charged at an hourly rate, similar to tattoo work. Depending on the type of artwork you commission, upon completion, a portion of the drawing fee can occasionally go towards the final price of the tattoo, depending on your written agreement with a specific artist, at that artists discretion. Please keep in mind when planning your tattoo; we have other clients waiting for their artwork to be prepared at the same time as you. It takes time, up to two weeks and in some cases longer to properly begin a design for a custom tattoo. The larger or more complex the design, the longer it will take to create your artwork. Please keep this in mind when planning and scheduling. If you would like a one-of-a-kind custom drawing, illustration, or painting of your tattoo design after your tattoo is completed as a family keepsake or memorial to hang in your home or office, Custom drawings, paintings and/or reprints on various materials can be produced of your tattoo artwork as an original piece signed by your artist. You can discuss pricing and availability with your artist as well as available mediums. This service is also available as a part of the Rewards Program, using rewards points. All artwork produced as part of the drawing process is © (Copy-Written and remains the property of) Aloha Salt Lake Tattoos and the artist that created/designed it unless otherwise agreed upon in writing. All rights reserved. You may not reproduce or share any artwork or sketches produced unless agreed upon in writing. If you have no preference, You can leave blank or type No Preference, First Available, or Best-Suited. Thank You! The information you just typed will be sent to the front desk. We will respond as soon as possible. Please be aware that This can take up to 48-72 hours, depending on schedules, days off, etc... If you require assistance before we are able to respond. Please call the shop directly at (801) 609.8288 or contact your artist directly.